Group 4 of the Twitch[www.twitch.tv] streamer skins are here, featuring the champions of Broadcaster Royale[broadcasterroyale.com] Season 1; thz_tv and dahmien7! 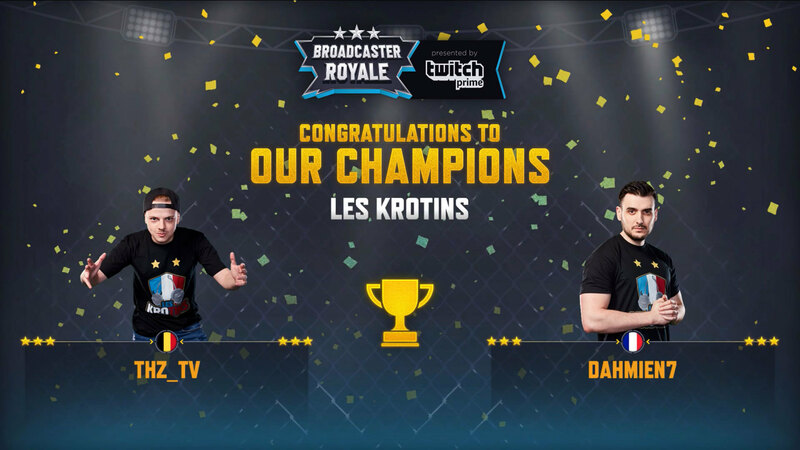 The two-man wrecking crew from Les Krotins battled it out and beat the odds against 80 other teams to take home the biggest Chicken Dinner of the season. You can support your winners by picking up their crates for the special price of $14.99. Each crate contains all 4 clothing items as well as their commemorative golden pans, featuring each winner’s logo. Skins are also available individually for $4.99 each and can be purchased until December 6th at 7pm Pacific through the game client, Steam, or directly from each streamer via their Twitch channel’s extension. Each sale directly benefits the Twitch streamer, so pick up your favorite skins and support them in-game and out! This group features skins from other Broadcaster Royale[broadcasterroyale.com] competitors as well, so read on for the full list of available items. I truly wonder where you would be without Twitch. Seems you just care about the steamers, and the kid's influenced by them + your skins that no other normal player can get.